The NHL schedule maker had a bit of foresight, sending the Colorado Avalanche to the east coast for the week after the Denver Broncos played in the Super Bowl. They played in New Jersey on Monday and won 2-1 in overtime, ever so slightly avenging the Broncos loss. The next night they played the Rangers, who had enjoyed a nice 3-day break after winning three in a row. I wasn't planning to go but tickets on StubHub were quite cheap. I bought one, resold it at a small profit, and bought another in section 206, row 2, so my total cost of attending the game was just $20. In general it is difficult to flip tickets for a significant amount of money as StubHub takes a cut on both sides of the transaction. For example, if you specify a price of $80 for a ticket, the buyer sees around $90 and you receive around $70 (numbers may differ depending on event). You'd have to buy tickets at an extreme discount, which I did at first, in order to make this a worthwhile endeavour. Anyway, one of the reasons that I bought a ticket down low in 206 is because I wanted to sit in a section with personal TVs, which are set up along the entire 200 level for first row patrons. Yeah, I was in the second row, but that didn't stop me from sneak-watching the replays in front of me. 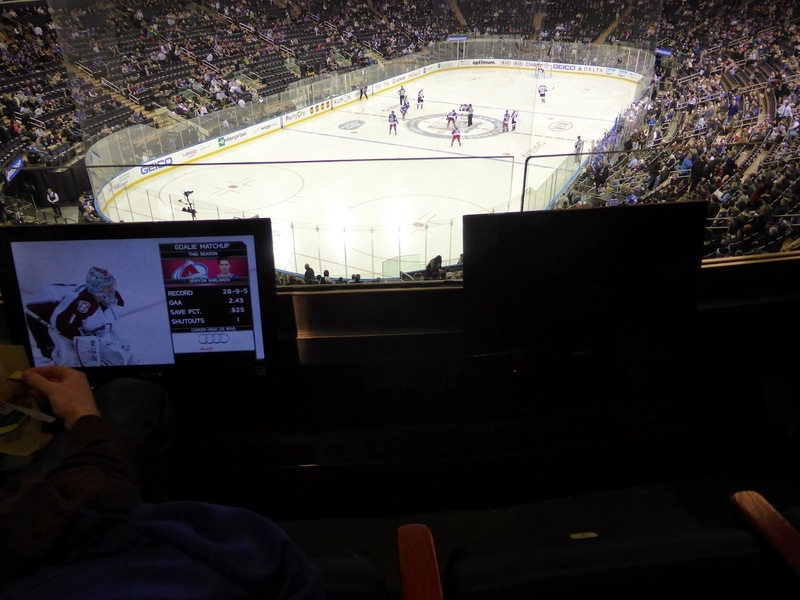 One person had his TV tuned to the delayed MSG broadcast which was about 13 seconds behind the live action. 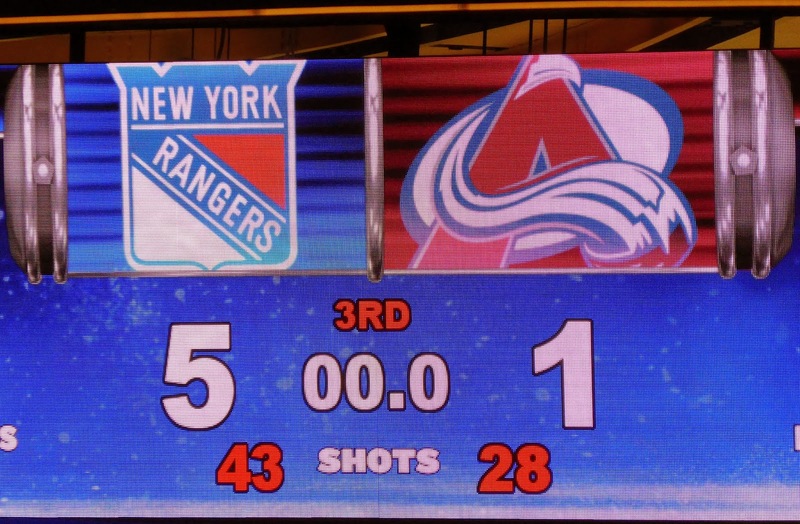 This allowed you to see the goals scored again, in real-time, which was kind of interesting. The Avalanche finish up their trip with games in Philadelphia on Thursday and Long Island on Saturday while the NBA gets into the act by sending the Nuggets to face the Knicks on Friday. For Denver fans, it would have been a great week for a sports road trip, except for, well, you know. As for Seattle, well, the Oklahoma City Thunder visited the Nets on the Friday before the Super Bowl, winning by 25.